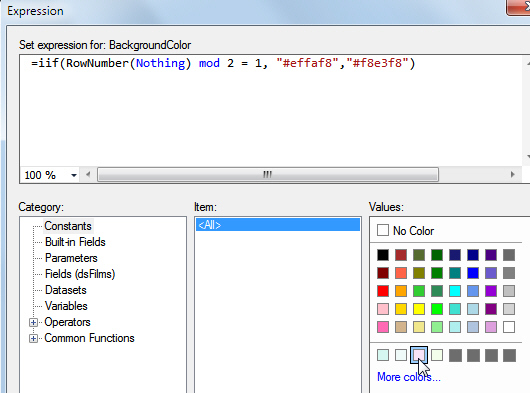 The simplest (and most common way) to colour rows conditionally is shown below. IF the row number is divisible by 2 with a remainder of 1, then colour the row blue; otherwise, colour it pink. Use the SHIFT key (easier) or mouse to select all of the cells in the row you want to format. 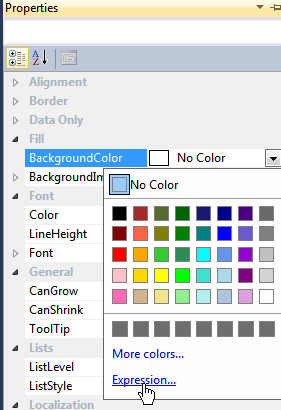 Find the BackgroundColor property of the cells, and choose to create an expression for it. Set the background colour differently according to the whether the number of the row is odd or even. The RowNumber(Nothing) function gives the row number of the current row within the scope of the table. Odd and even rows are coloured differently. In most cases the above approach will work OK, but it breaks down for some grouped reports and it's not very flexible. An alternative - but more complicated way - is to use a custom assembly, as shown in the final part of this blog.